Through his earlier career as an international corporate executive, residing in Canada, Europe, Africa and Asia, Klaus has a global perspective of the best places one could choose to live. After experiencing cultures far and wide, he chose to call Sarasota his home. Our Gulf Coast city offers everything one can dream of - not only the weather and the beaches, but also the culture, the infrastructure and the c... more.hance to interact with interesting people - both with a domestic as well as international background. Klaus recognizes that the lifestyle is second-to-none and that it’s the main reason people move here. With this enthusiasm for the area, he started his career in real estate. His passion was evident in everything he did. Sometimes buyers would ask him why he wouldn’t buy the properties he marketed himself (as he seemed to love them so much!). It was not surprising then, that his skills were noted after a short period of time. 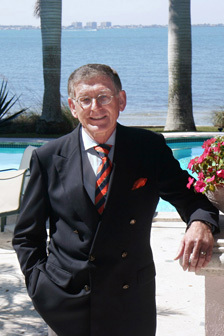 As a result, he has been involved in the sale of some of the most exclusive homes in the Sarasota/Manatee region. He represented the buyers in the largest real estate transaction in Sarasota, the purchase of a Lido Key home and adjacent vacant property for a combined price of $16.5 million. In 2015, Klaus sold the highest priced property Michael Saunders & Company has ever represented, Little Bokeelia Island, offered at $29.5 million. While real estate is his passion, he takes advantage of the opportunities he came here for - and he still loves to travel globally. As a longtime member of Rotary International, Klaus served this global charity organization with hands-on experience in all the countries he’s lived in. He still attends Rotary meetings wherever he travels, maintaining his international connections.